The spathiphyllum is better known as the Spath or the Peace Lily. The spathe is often a creamy white that fades to green or yellow. A single spathe appears for each blossom that forms on the plant. While not a true lily, the popular of the Peace Lily has endured. It is grown for both commercial and residential landscaping purposes. It is also widely used as a house plant or gift throughout the year. Many hybrids have been developed that feature new colors or blooms. Leaf color, as well as density, have been altered in some hybrids. Some hybrids also produce multiple blooms, making them look unique. S. Mojo is a hybrid that offers rich and glossy dark green leaves. This hybrid can be adapted to both smaller and larger containers. In containers, the leaf growth is dense, with multiple blooms forming. S. Starlight is known for its ability to have multiple creamy blooms. Leaves have wavy edges, creating a unique background for flowers. Up to twenty blooms may be present during the flowering season. Because of its heavy blooming, S. Starlight is a popular houseplant. It can be adapted for smaller and larger containers for home growing. Dense flowering will occur with proper care and optimal conditions. Spathiphyllum typically blooms in the spring in gardens or the wild. Those that are grown indoors can be forced to bloom in fall or winter. Forced bloom can lead to year round flowers to enjoy around the home. When grown outdoors, plants may be placed in containers or gardens. Warmer climates are better suited to growing the plant in gardens. In cooler climates, containers are often recommended for best growth. In a garden, massed displays in the shade are preferred for plants. A moist area is often recommended though soil should drain well. Too much or too little water can lead to wilting or rotting of plants. When grown indoors, partial sun is often preferred by many species. Diffused lighting should be used whenever possible to avoid scorching. Soil should be kept lightly moist and never allowed to fully dry out. Light misting may be used to provide more moisture between watering. This can help to provide higher humidity that the plants need to grow. A rock tray may also be used to help increase available humidity. The white color of blooms has been used to symbolism purity of heart. It can be used in many ways to symbolize trust and purity to others. Cut blooms, as well as live plants, can be used as a floral gift. The Peace Lily is a popular choice for funerals and condolences. Used in this context it represents sympathy and respect for someone. These are typically delivered as a potted plant to take home later. The Spath is also a top choice as a housewarming gift for friends. The dense and rich green leaves provide lush foliage year round. Heaving blooming hybrids can also provide months of fragrant blooms. Though typically used as a potted plant, cut stems may be used. These may be added to spring wedding bouquets to add rich color. 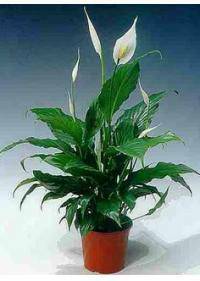 Spathiphyllum blooms may be mixed with other lilies for more impact. This flower is commonly sold in plant form throughout Victorville, CA, West Covina, CA, Roseville, CA, Huntsville, AL, and Carson, CA areas. Cut versions may also be available for special order, depending on the location.